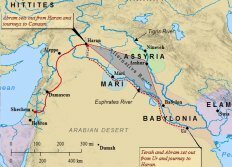 The travel patterns described in Genesis are consistent with what historians and archaeologists have uncovered from the Near East in ancient times. The story of Abraham starts with a journey. Abraham lived in a very interactive society. Wandering clans, or tribes, of extended families were never far from settled urban areas. These traveling clans consisted of many different levels of family, servants, slaves, livestock, animals, and all other possessions. Some of these clans were very wealthy and powerful, and contained large populations. They bought and sold goods with local merchants and peoples, then picked up and moved on to the next location. These wandering clans tended to travel along routes with ample water. These routes ran near rivers, brooks, streams, lakes, etc. However, caravan routes also ran East to West, leading directly through the heart of the Arabian desert. 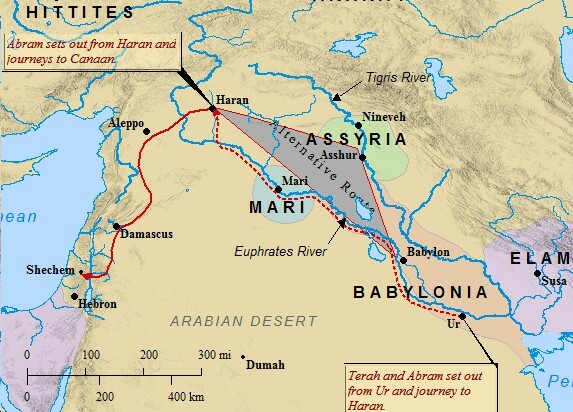 These routes connected Mesopotamia directly to Canaan. Though much shorter in distance, these caravan routes were much more dangerous and less traveled than the routes leading northward, along the Tigris and Euphrates rivers. The book of Genesis describes the story of Abraham and his father, Terah , as traveling along one of the northward routes along the Euphrates. Abraham was not a settled man, nor was he a wanderer. Rather, he was a combination. This fact is alluded to in the terms that are associated with Abraham. He is called an Aramean, Hebrew, Aramu and Habiru. These terms are commonly used to describe seminomads; people that live outside the typical structure of settled civilization. Over time, these terms merged together to form the catch all word, Arab. The book of Joshua tells how the Israelites ancestors - Terah, Nahor, Abraham - lived "beyond the Euphrates", and served other gods. It has already been noted that Terah was a known idolater. The narrative in Genesis suggests that perhaps Terah was the initial receiver of God's call to leave Mesopotamia. Yet, Terah failed to obey God, and stopped in Haran. Terah could not break from his idolatrous beliefs, and clung to the polytheistic system of religion in Babylon. His settlement in Haran is seen by God as a sign that Terah will not step out in faith and obey. Thus, the next chapter of the story of Abraham begins with God's call for him to leave his "father's household", and head for the land of Canaan. What insights do you have into the lives of Terah and Abraham? Please give us your thoughts, opinions, questions, and comments by clicking on the link above! Even the most prolific of the Bible Archaeologists, William F. Albright, struggled with dating the story of Abraham. Much of the ancient dating rests on the Egyptian Pharaoh lists, provided by such historians and scholars as Manetho, an Egyptian priest whom wrote during the Hellenistic Age, circa 250 B.C. These lists allow us to trace Egyptian history as far back as 3000 B.C. A similar resource rests in the writings of a Babylonian priest named Berossus. Berossus gives a Mesopotamian king-list similar to the Egyptian lists, and others have been discovered throughout the course of time. These lists, and other ancient sources, have helped scholars and Bible historians date the story of Abraham with relative certainty. Though the exact date of his life is still unknown, the general time of his life is widely agreed upon. It is interesting to note that similar records are found in Genesis. Two lists are given; one containing names from the antediluvian world, the second containing names from the post-diluvian world. Each list contains ten names. The earliest Mesopotamian king-lists contain 8 names. However, Berossus' list contains 10. Paul Johnson argues in his book, A History of the Jews, that perhaps the connection between the two is Abraham, who brought the tradition with him. Indeed, the story of Abraham starts in Mesopotamia. It is quite possible that many of the traditions and stories in Sumerian mythology, are parallel accounts of the Bible stories they share so much in common with. There is a clear and obvious similarity between ancient Mesopotamian stories of the flood, and the Genesis flood. 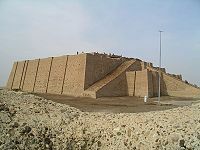 The ancient Mesopotamian city of Eridu, near Ur, has been tied with the Biblical Eden. Some scholars claim the Enkidu of Mesopotamian myth stories, is the same as Enoch of Genesis. It becomes clear the story of Abraham is heavily influenced by his Mesopotamian background. Abraham, as the link between the two, is not unreasonable at all. Sargon, and the Old Akkadian Period from 2360-2180 B.C. ; Ur-Nammu, and the Third Dynasty of Ur, from to the end of the second millennium, or start of the first; Hammurabi, dated to the exact period from 1728-1686 B.C. Scholars have dated the story of Abraham in Genesis as occurring in the period between Ur-Nammu and Hammurabi. This period falls in the Middle Bronze Age, from between 2100-1550 B.C.E. The story of Abraham and the other Patriarchs are widely agreed upon to have happened in this window. Albright, after years of study and wavering, finally concluded that Abraham existed between the 20th and 19th centuries B.C. The Ussher chronology places the story of Abraham around 2000 B.C. Traditionally, his birth was placed at 2056 B.C. However, this was not widely agreed upon, and many other dates have surfaced over the course of debate. Edward R. Thiele published a modified chronology which placed Abraham's birth in 2167 B.C. Though the date is not agreed upon unanimously, his existence is rarely denied. 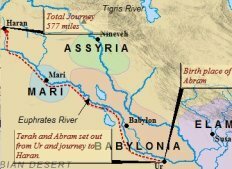 The names mentioned in the Abrahamic narrative correspond with many names located throughout northwestern Mesopotamia, particularly Haran and the surrounding neighbors. It is reasonable to make an assumption that the patriarchal narratives and traditions were born in this region. The story of Abraham and his arrival in Canaan, along with the other Genesis patriarchs, have been associated with northwestern-speaking Semitic peoples. These people came after the Amorites, but perhaps were Amorite in lineage. Abraham, Isaac , and Jacob are Israelite, as well as Amorite, names. Best selling author Bruce Feiler (Walking the Bible) explores the spiritual roots of Abraham through the eyes of each of the major three world faiths; Judaism, Christianity, and Islam. All three trace their origins to father Abraham. Feiler highlights the traditions and legends each religion associates with Abraham, and compares Abraham in the Bible to Abraham in the Quran. This book is a must for those seeking to understand Abraham. Click on the link below to visit amazon.com and Abraham! ABRAHAM'S JOURNEY INVOLVED MULTIPLE STAGES. UPON ENTERING CANAAN, HE WOULD CONTINUE TO WANDER THROUGHOUT CANAAN, LIVING IN VARIOUS PLACES, GAINING INSIGHT INTO ALL OF THE LAND YAHWEH HAD PROMISED HIM. Genesis 11:10-26 traces Abraham's lineage back to the ante-diluvian Patriarch Noah. Abraham is a direct descendant of Shem, Noah's son . As stated earlier, Shem was the son of Noah through whom God's promised "seed of the woman" would be transmitted to further generations. The story of Abraham, thus, reaches back to the time before the Biblical flood. In fact, some chronologies place Abraham's birth a mere 300 or so years after the flood. These chronologies, however, are highly debatable. Abram, his original name, was the one through whom God would bring forth His nation of Israel. The first mention of Abram in the Bible takes place in Genesis 11:26. Abram has two brothers we are aware of, Nahor and Haran. Haran, verse 28 tells us, died before "his father Terah in the land of his nativity, in Ur." Thus, we learn our first bit of background information concerning the story of Abraham. Abram's family came from Ur, though, one can assume Haran lived elsewhere. Haran, it is reasoned by some scholars, lived in Haran, the city named after him. The Genesis narrative tells us Haran died while Terah was still alive, and while he was visiting his father in Ur. Thus, when God calls Terah, his family includes extended members from Haran's household, left over in Ur after their father's death. Nahor, Abram's other brother, marries Haran's daughter Milcah. Sarai, the wife of Abram, was also a daughter of Haran, yet, from another wife. She was only a half-sister to Abram. Haran left behind one son that we are aware of, Lot. Lot became closely attached to his Uncle Abram, and left Ur for the land of Canaan as well. Seemingly, Abram became Lot's guardian when his father died. As Terah and family left Ur behind, surely they felt a sense of loss and remorse. This was their home. Ur, in this era of history, was a great city. Ur was an extremely popular and busy seaport in its day. It was a city of wealth and comfort. There was a magnificent library at Ur, and luxurious temples and royal palaces were found throughout the city. It was a city of greatness. Terah and his family were leaving all of this behind, to venture into a land they knew nothing about. This fact in itself fits with God's plan for the establishment of His people. Deuteronomy 7:7 talks about God's people. "The Lord did not set His affection on you and choose you because you were more numerous than other peoples, for you were the fewest of all peoples." 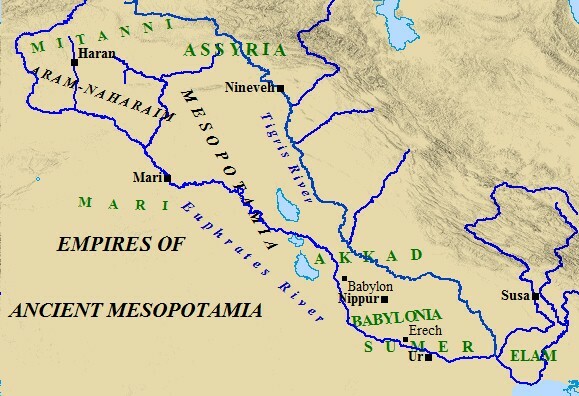 Mesopotamia produced some of the greatest empires in the history of the world. The Sumerian Empire, Akkadian Empire and the Babylonian Empire left their hand prints on history. The story of Abraham involves these empires as well. For it is out of their world which Abraham emerged. He had been shaped and influenced by these empires over the course of his life. Yet, there was something special about Abraham, besides his lineage. God saw it, and called him. The Amorites dominated Mesopotamia for a span of 200 years. The Egyptians had ruled for over a 1,000 years by the time Abram migrated there. These were the powers of the ancient world. Canaan was a land of no significance. It was simply a buffer zone between Egypt and the powers to the East. The people of Canaan were truly the "fewest of all the peoples" in the ancient world. The land of Canaan was approximately 600 miles due west of Ur. Instead of striking out westward, into the heart of the Arabian Desert, the clan travels northward, along the Euphrates. As stated earlier, there were caravan routes, and trade routes, leading through the heart of the desert, directly into Canaan. These routes, however, were much more dangerous, and less traveled. 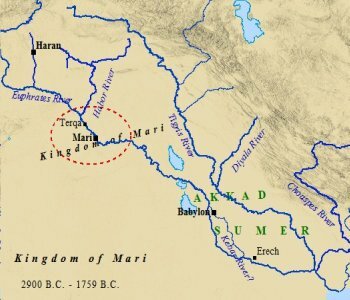 Terah, instead, heads northwest, up the Mesopotamian valley, along the Euphrates River. Archaeology has shown that these migrations were common in antiquity, and most traveled along the rivers and valleys, substituting comfort and security for the more direct, yet, more dangerous route through the desert. "And Terah took Abram his son, and Lot the son of Haran his son's son, and Sarai his daughter-in-law, his son Abram'swife; and they went forth with them from Ur of the Chaldees, to go into the land of Canaan; and they came unto Haran, and dwelt there." It is interesting to note that Haran, like the city of Ur, was a city dedicated to the worship of the moon god Sin. 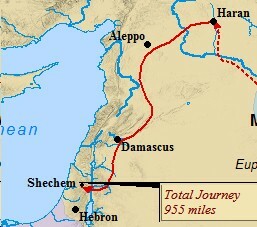 Haran was located on an important trade route connecting Canaan in the west, with Syria in the east. The city is still in existence today, and quickly became an important city of antiquity. It was here that Terah settled. It was here that Abram's family had strong ties to the land. 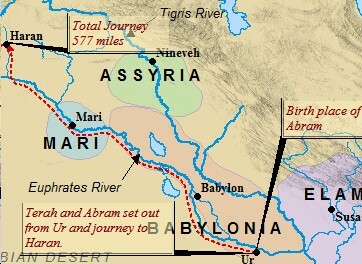 Haran carried the name of Abram's brother. A nearby city, Nahor, also carried the name of another of Abram's brother, Nahor. Passages throughout Genesis imply Nahor had family still living in the region, and Abram, as well as the later Patriarchs, were fully aware of their presence. It is interesting to note that in the New Testament book of Acts, chapter 7, Stephen is preaching on the story of Abraham in front of the Sanhedrin. He states that Abraham received God's call while "he was still in Mesopotamia, before he lived in Haran". Perhaps this suggests that Abram and Terah had both received divine inspiration to leave Ur for Canaan, and both had initially responded in faith. Terah, however, found the prosperity of Haran, and the familiar familial connections, too tempting to leave behind. He died in Haran, at the supposed age of 205. Terah's disobedience, led to the Lord's instruction to Abram in Genesis 12:1. "Now the Lord had said unto Abram, 'Get thee out of thy country, and from thy kindred, and from thy father's house, unto a land that I will show thee". The land that God would show Abram was the land of Canaan; the land settled by the descendants of Noah's cursed son, Ham. Thus, the families of Ham and Shem again were to come into contact with one another. In the opening verses of chapter 12, God promised Abram his name would be blessed, and through him God would make a great nation. Throughout the story of Abraham God constantly is reassuring Abraham that He will be faithful, and multiply Abraham's descendants. Abraham faced a tremendous amount of pressure and unknowns. He needed the constant reassurance from God. God, as He always does, provided Abraham with exactly what he needed. God also promised protection upon Abram, blessing those that blessed him, and cursing those that cursed him. So, in verse 4, Abram is said to have departed from Haran, "as the Lord had spoken unto him." The story of Abraham was to reach its climax in the land God would show him. Accompanying Abram and Lot on the journey were Abram's wife, Sarai, ten years younger than Abram. Along with his wife, Abraham took all of the possessions, including servants and slaves, he had gathered in Haran. Lot brought his family as well, and all of his possessions. Abram's travel party would have been fairly large. The trek to Canaan from Haran was approximately a 400 mile journey to the southwest. Though Abram knew generally where he was heading, he knew no specifics. Trade routes from Haran to Damascus, and from Damascus south into the Canaanite countries, had been well established by this time, so the general direction of travel was known. 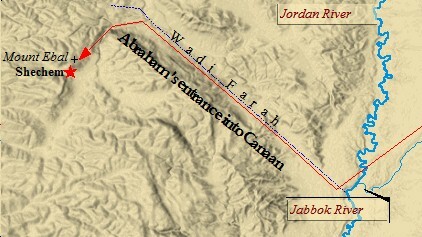 The exact route Abram took from Haran to Canaan is not known. The most direct route from Haran would have led directly through the desert to Damascus, via the Tadmor Oasis. This route was a dangerous and risky venture to say the least. A safer, alternative route followed the main branch of the International Coastal Highway. This route led through the ancient cities of Carchemish, Aleppo, Ebla, home of the Ebla Tablets, Qatna, and into Damascus. From Damascus, the King's Highway led into the Trans-jordan (Syria and Jordan). The story of Abraham was to take on a new element in the land of Canaan. He and Sarah, together, would be called upon to establish a new nation. Are you interested in Abraham? What are your thoughts concerning his life? Muslims, Jews, and Christians alike share a common bond with Abraham. Share your thoughts and comments on Abraham and his remarkable life!